Kaitlin Wright was driving her boyfriend, Brent, crazy with all the Petfinder photos of adoptable dogs she was forwarding to him. “He was begging me to just pick one!” she says. Coach is part of a happy team. It was hard. Her beloved dog, Riley, of 14 years had died, and he had been such a special dog to her that “the next dog had some really big shoes to fill,” she said. A problem loomed. Kaitlin lives in Rochester, New York, and Bandit was in Ithaca, and the shelter wasn’t open on Wednesdays, the only day she and her boyfriend had off work. She fretted about it, but her boyfriend stepped in to help. He could foresee being bombarded with more photos. He called the shelter, and the staff was more than willing to let them visit on a Wednesday. Wednesday came, and they set off, including Brent’s dog, Roxie, for a meet and greet. Kaitlin began to get cold feet. 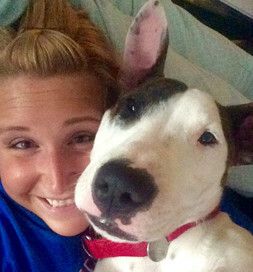 “I had never adopted a dog before and was nervous about training,” she says. Brent calmed her down and reminded her how despondent she’d been over the loss of Riley. She took the plunge and adopted Bandit that day. She promptly re-named him Coach K after Mike Krzyzewski, the coach of the Duke University Blue Devils. It’s clear that she’s a diehard Duke basketball fan. Roxie was a little overweight when Coach moved in, but no more. She’s now at her ideal weight. “We also believe that he has brought her youth back. She’s much more active and playful and just seems happier to have a partner in crime to hang out with while we’re at work during the day,” Kaitlin says. Goofy he may be, but that quality and the laughter it brings is the perfect antidote for a grieving heart.